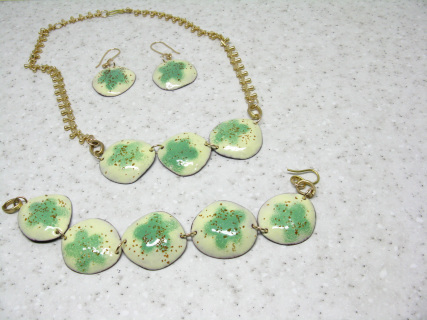 All of my beads are properly annealed to ensure durability and long life. Since my beads are handmade, the one's you order may not be exactly as you see in the picture, but I will ensure to get them as close as possible. These earrings are made with pennies - that's right pennies. Each penny is rolled, hammered, drilled and shaped then fired with layers of glass. 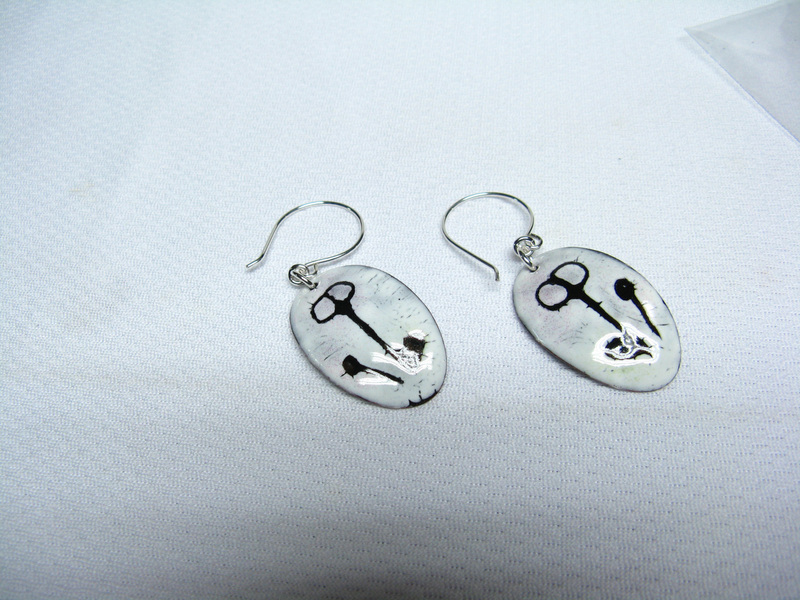 The earrwires are handmade with sterling silver. 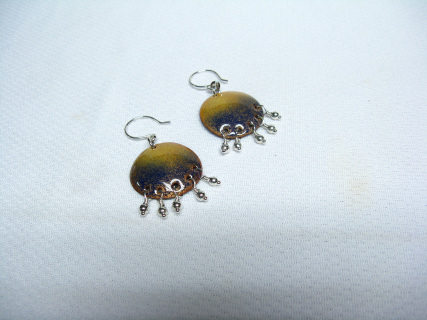 These earrings are made with pennies - that's right pennies. Each penny is rolled, hammered, drilled and shaped then fired in several layers with glass. The earwires are handmade with sterling silver. 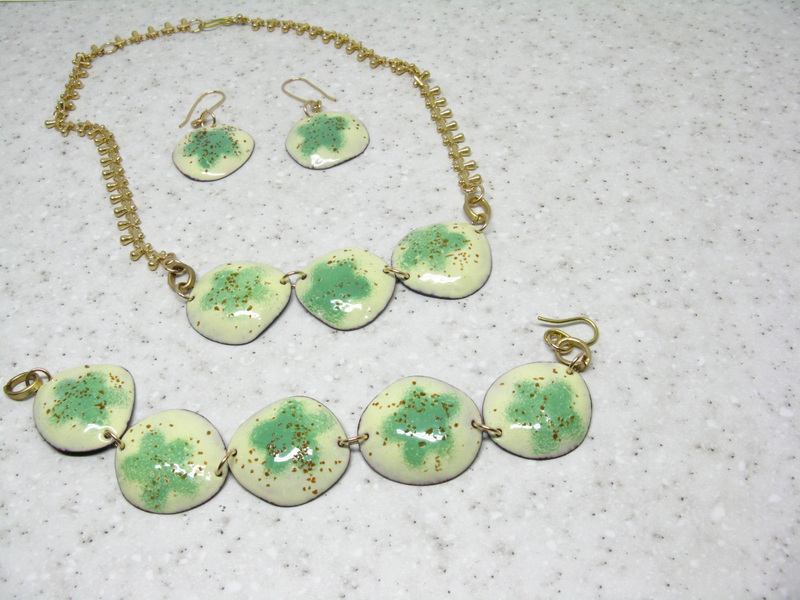 Price is for necklace only - 116BR-1 - Bracelet is made with gold plated brass - $75.00 or 403-1ER Earrings made with 14KT gold filled earwires. 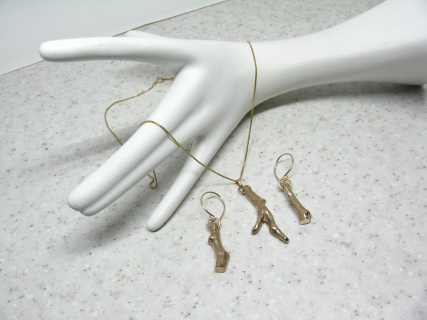 Handmade sandcasted bronze branch necklace. Chain is 14KT gold filled. 409ER - Earrings - branch is sand casted in bronze and the earwires are 14KT gold filled- $60.00. - Sold seperately. This is a locket which is made from sterling silver that is hand cut and stamped. 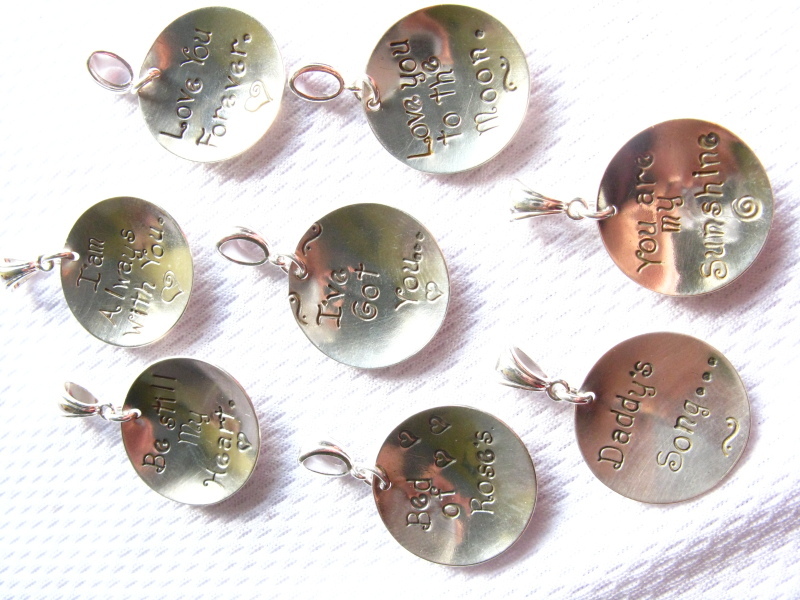 The locket comes with front and back cover (1"), 1 small disc (3/8") in the inside and a bail to hang from necklace. When purchasing this pendant please send what you would like on the front cover, inside disc and rear cover. 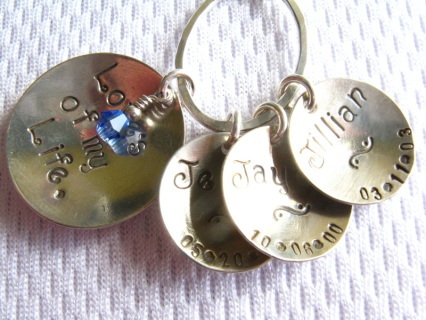 This pendant is made with 1" disc and 3 of 3/8" disc of sterling silver which is hand cut and each letter is hand stamped with a hammered ring which comes with a bail to attach to your necklace. The pendant also has a blue crystal for embellishment. When purchasing this pendant, please send what you would like on the large disc, the names of the childern and birthdates or birth weights. This style of pendant is 1" diameter, made with sterling silver that is hand cut and stamped, comes with 3 crystals of choice and bail. The price is for only one pendant. 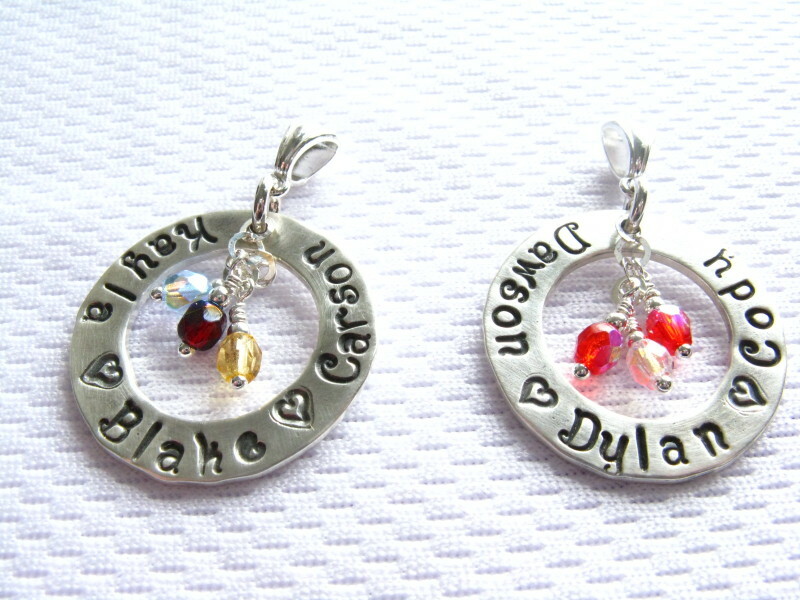 When purchasing please provide the names and colors of crystals wanted on pendant. 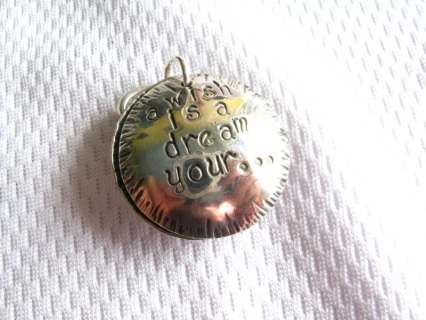 This pendant is a 3/8" round disc made from sterling silver that is hand cut and stamped. 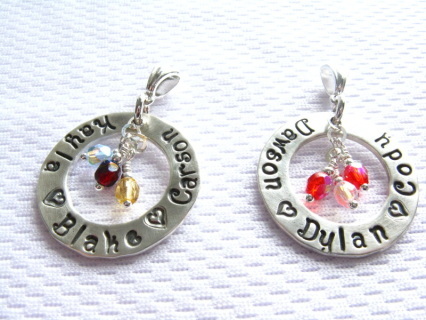 Each Love Note comes with a crystal of choice and a bail for necklace. Price is for each pendant. If you are not statisfied with your purchase, you will be refunded excluding shipping cost, within 30 days, provided the item has not been worn or damaged. Special order sales are final.